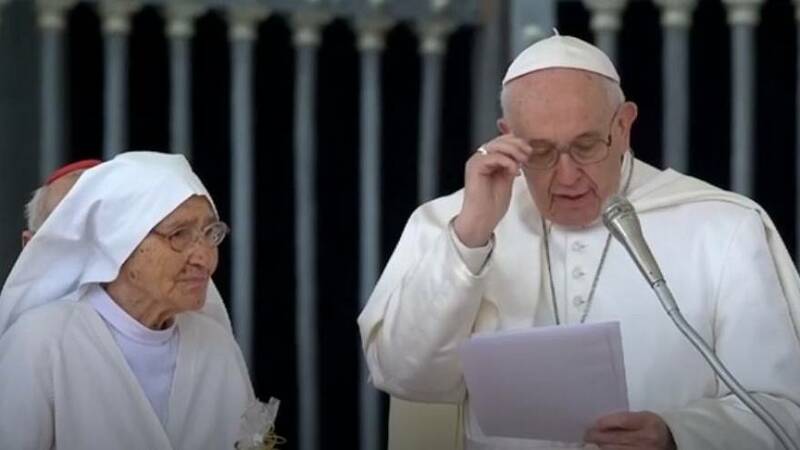 The Pope has honoured a nun who has delivered 3,000 babies over her lifetime. Pope Francis may have appeared reluctant to allow worshippers to kiss his ring two days ago, but he was more than happy to share kisses with 85-year-old Sister Maria Concetta Esu, who he presented with a medal on Wednesday. She has carried out missionary work as an obstetrician for 60 years in the Central African Republic. Pope Francis said: "Today we have the joy to have with us a person who I would like to introduce you to. It is Sister Maria Concetta Esu from the Congregation of the Sisters of St. Joseph of Genoni. And why am I doing this? Sister Maria Concetta is 85-years-old and for about 60 of them has been a missionary." The last time Sister Maria met the Pope, she arrived in a canoe. He recalled: "I got to know her in Bangui when I went there to open the Jubilee of Mercy. She told me how in her lifetime she has helped to deliver around 3,000 babies. How marvellous. On that day she came to the Congo in canoe, 85 years old, to do some shopping in Bangui." The Vatican also announced that the Pope would visit the African countries of Mozambique, Madagascar and Mauritius from September 4-10.